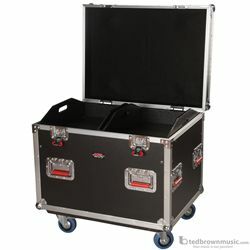 Tour Style Truck Pack Case; 45" x 30" x 30" with 12mm plywood construction. 12mm plywood construction with laminated exterior with red recessed twist latches. Heavy duty commercial grade plated hardware and reinforced stackable ball corners. Truck pack trunk with hinged lid and grey carpet interior with recessed dishes on top of case to allow stackability. Four casters with two locking and includes three dividers and two liftout trays.